The U.S. dollar was seen trading volatile on the day as the results poured in through the early trading hours of the European session. With the Democrats claiming a majority in the U.S. House while the Republicans are retaining a majority in the Senate, speculation is rife on how the U.S. policies will be implemented going forward. Economic data on the day covered the German industrial production which beat estimates of a flat print to rise 0.2% on the month. Previous month's data was revised higher to show a 0.1% increase. The NY trading session saw Canada's Ivey PMI rising to 61.8 on the index. This beat estimates of 50.9 and advanced from 50.4 from the month before. 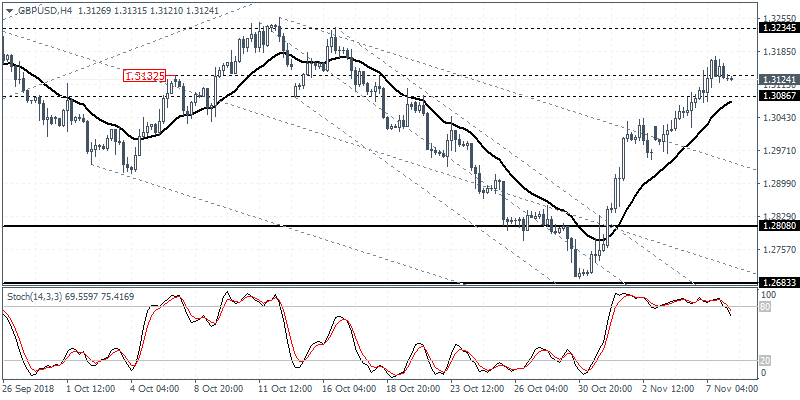 The overnight trading session saw the Reserve Bank of New Zealand holding its monetary policy meeting. The central bank kept interest rates unchanged at 1.75% and retained its forward guidance. Looking ahead, the economic calendar for the day will see the release of the German and French trade balance numbers. The economic data from the Eurozone is relatively quiet for the most part today. The NY trading session will see Canada's housing starts report coming out. Data is expected to show that housing starts rose 195k on the month following a print of 189k the month before. Later in the evening, the FOMC will be releasing its monetary policy statement. The Fed funds rate is forecast to remain unchanged at 2.0% - 2.25%. EURUSD (1.1424): The EURUSD gave up the gains from earlier this week as price action retraced back to the breakout level of the falling trend line. Currently, the price is supported by the 20-period EMA and the horizontal support area. As long as this support holds, we expect the currency pair to be biased to the upside. However, if the EURUSD slips back lower, we expect the declines to push the common currency back to the lower support level of 1.1315 - 1.1300. 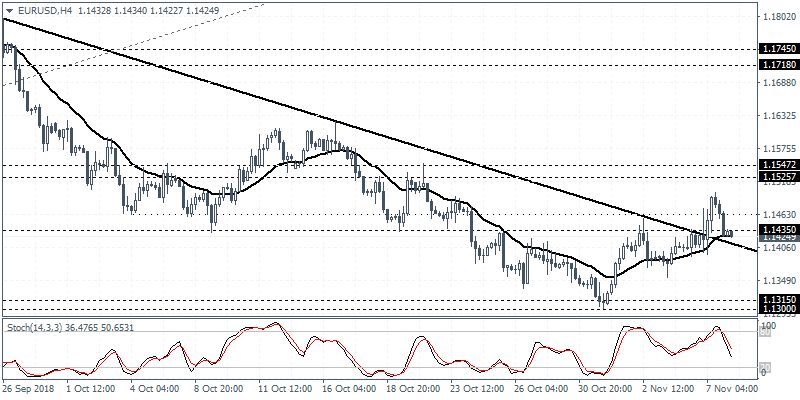 GBPUSD (1.3124): The GBPUSD currency pair managed to clear the resistance area of 1.3058 - 1.3132. However, price action is seen to be consolidating strongly just above this level. This could potentially signal either a continuation to the upside in which case the GBPUSD will target 1.3234. Alternately, a break down below the support level could indicate a move back to the downside which could retrace some of the gains made recently. 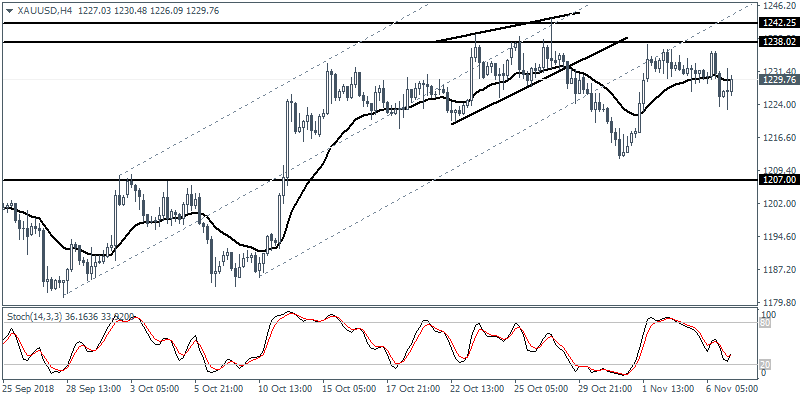 XAUUSD (1229.76): The volatility in the gold prices continue as price action is seen extending the declines. The breakout from the minor rising trend line suggests that price action could extend the declines back to the previously formed lows. The support level at 1207.00 remains untested which makes this exposed for a downside correction. To the upside, the resistance area of 1238 - 1242.25 remains a key level that will likely hold the gains in the near term. This market forecast is for general information only. It is not an investment advice or a solution to buy or sell securities. Trading foreign exchange on margin carries a high level of risk, and may not be suitable for all investors. Before deciding to trade foreign exchange, you should carefully consider your investment objectives, level of experience, and risk appetite. There is a possibility that you may sustain a loss of some or all of your investment and therefore you should not invest money that you cannot afford to lose. You should be aware of all the risks associated with foreign exchange trading, and seek advice from an independent financial advisor if you have any doubts.